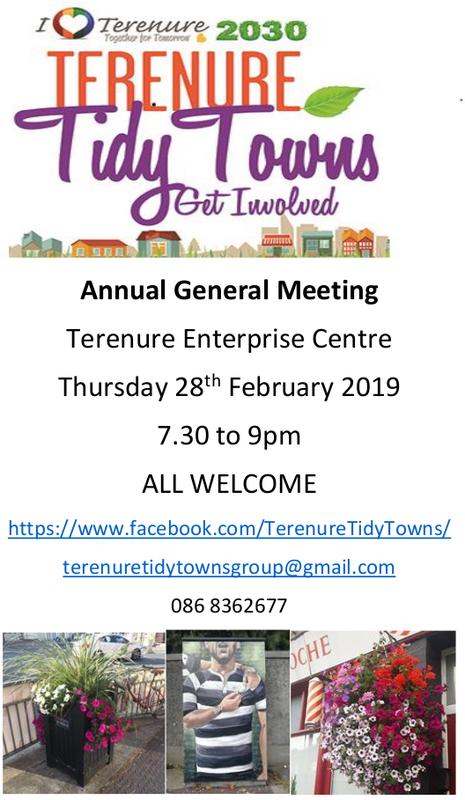 Terenure Residents Association represents about 750 households in the area south, east and southwest of Terenure Cross, including those in the vicinity of the above site. We wish to submit an observation on the developers’ appeal. The required fee of €50 is enclosed. We were astounded that the decision of the City Council has been appealed considering that it so comprehensively refused permission for the development. The proposal had generated an enormous amount of concern among Terenure residents which is evidenced by the 180 letters of objection that were sent to the City Council and an attendance of over 150 at a public meeting. On the understanding that An Bord Pleanála will have sight of these letters and because of the €50 fee required, it would not be logical to expect the same volume of observations on the appeal. 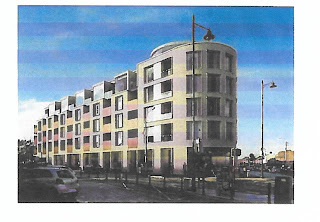 We note that the developer has submitted a revised design as an alternative which reduces the building by one storey. This would be a major change which we feel should have been the subject of a new application. We query the validity of this procedure unless An Bord Pleanála requests a revision. Apart from the height reduction, the alternative design does nothing to reduce the negative impact the building would have on the character of the area. The design of the building is very much a block which is slab like in appearance. That applies to the five storey version as much as the six storey one. Its design and materials are not in any way compatible with the neighbouring buildings. The appeal has not in any way addressed the criticism of the position of the building on the site, flush with the pavement. This is very much forward of the building line of Templeogue Road and will present a very unfavourable looking “gateway” to Terenure. It will have a domineering effect on the road and surrounding properties. The appellant disagrees with the City Council’s designation of the development as “infill”. We would support the Council’s view on this as the site is effectively a vacant one at the end of a road with two storey houses. The appellant claims that the street is devoid of character and, by implication, that there is no need for a sympathetic building. This assumption completely ignores the red brick buildings on Terenure Place and across the road on Terenure Road West. A building or buildings in harmony with these set back from the road, would be much more acceptable. The statements in the appeal about the present use of the site are nonsense. It has, for a long time been an “opportunity” site, in use on a temporary basis as a car sales area. This site is very much part of the Village of Terenure. It is in a very prominent location at one end of the junction complex of five main roads around which the village has developed. This is very much an opportunity site, and one which’ because of its location, should be treated in a way that will produce an iconic landmark development that will enhance the fabric of Terenure Village and become a focal point. We submit that this proposal does not, in any way, fulfil this requirement and would disagree with the appellant’s claim that it does. In fact, it would have the opposite impact. We disagree with the appellant’s claim that “the building will successfully integrate with the surrounding environment”. Overlooking of houses on the south east side of Templeogue Road has not been dealt with and the domineering impact of the development on No, 15 Templeogue Road. is not in any way mitigated with the 5 storey alternative. No mention is made of impact on Olney Crescent. There is still an abrupt transition in scale when viewed north-eastward from Templeogue Road, both by virtue of the increase from 2 to 5 or six storeys and the position on site of the building flush with the pavement… The photographic montage view position on Templeogue Road in the original submission is so far away that it does not in any way show the impact of the proposed building on Terenure Place. No attempt has been made in the appeal to come to terms with City council’s views on the inadequate provision for car parking. We are very concerned about cars owned by apartment residents which are not allocated one of the 37 parking places provided. This applies even in the context of the reduced height building. Most of the surrounding residential roads have metered parking and many houses have no off street parking. There is almost no space available for overspill from the proposed development. There is no provision for a pull in area for the proposed shops. This would need to be somewhat off street or with a turn back possibility if the Busconnects plan is implemented as presently proposed. The proposal calls for the destruction of the last remaining section of the circle of houses which date from 1801 and gave Terenure its old name of Roundtown. A similar situation arose when Aldi was building a supermarket on the old tramway depot nearby. They acceded to a request to preserve the outline and materials of the old building, While we appreciate that the round house is not a listed building it should be preserved as part of the heritage of Terenure. The City Council planner’s report refers to this. Terenure is an area where there are many big old houses. A lot of these have only one or two elderly people living in them. There is a major requirement for suitable “step down” accommodation to which these people could move without having to leave the area. Also, Terenure is very much a family-oriented area with plenty of schools etc. The proposed mix of accommodation will not cater for either of these needs as it would be directed at single working people. While there is an undoubted need for such accommodation, we submit that a more settled population would make a much better contribution to community life in Terenure. While as noted above, there is unlikely to be a similar building proposed for Terenure Village, permission for the above proposal would set a very bad precedent and encourage unsuitable developments in the immediate area. 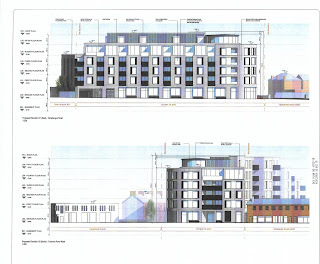 Because of its size, height and general incompatibility with the heritage ambience of Terenure, we request that the proposal be refused planning permission. All residents in our area (map here) are invited to attend. Public Representatives and the Gardai will be in attendance. Refreshments will be available. Please consider helping to represent your area by offering your services on the committee. The committee meets once a month in the evening for 9 months of the year, each meeting typically lasting 90 minutes. Representatives from the Association recently met with the NTA (National Transport Authority) to discuss the impact of the BusConnects proposals on our area. Inbound traffic at Templeogue (Springfield Road junction): how would the enforcing of local traffic only towards Terenure be accomplished? Handling of Bushy Park patrons’ traffic and local access issues – Possibility of car park on south side of Dodder? Reinstatement of footpath alongside fence on Templeogue Road? Ingoing bus and cycle lane only lane between Olney and Terenure Place: could it be restricted to peak hours only? Similar consideration for Terenure Road East. Harold’s Cross Road will be the only direct route to the City from Terenure with Rathmines Road and Kimmage Road closed to inbound traffic. What alternatives are there? Proposal of a pilot scheme for this with short approach bus lanes. The NTA took note of and discussed these concerns and agreed to consider them as part of their consultation process prior to publishing a revised plan later in the year. The consultation process is ongoing and anyone can make a submission, but please note the final date of 30th April for making a submission. See BusConnects leaflet for details - this is being distributed to all houses in our area along with notice of our AGM, which will be held on 16th April in St. Joseph's Parish Hall. BusConnects will be on the agend. The Sisters of St Peter Claver, long standing residents on Bushy Park Road, are holding their annual Spring Sale. This year the proceeds will support St Martin de Porres Brothers in Nebbi Diocese, Uganda, to supply school equipment and resources for poor children. They need 200 benches at €30 each. The Sisters are seeking donations for the Sale of good brick-a-brack, saleable clothes, plants, unwanted gifts and new items for the Wheel of Fortune. Convent, 81 Bushy Park Road; Tel 490 9360. (Charity No. CHY 3462). Please come along and bring your friends on Sunday 7th. We will be grateful for your support. Tomorrow, Saturday 9 March, marks the return of the market to Bushy Park, from 11am - 4pm. For the children, there will be a visiting petting zoo from 1pm. Please be considerate of local residents and walk or cycle to the park if possible. On Monday 11 March at 9.35pm RTE1 will be showing a documentary called "Fertility Shock" which includes footage filmed at the Evergreen Club in Terenure during one of their Tea Dances last year. Watch out for it! Terenure Tidy Towns - notice of AGM - ALL WELCOME! St. Joseph’s Parish Hall, Beechlawn Way, Terenure. This week the National Transport Authority (NTA) announced Phase 2 of the Bus Corridor Project. Councillor Anne Feeney is hosting a Public Meeting to give people an opportunity to hear a short presentation on the proposals and to discuss the impact for our area. Many residents are extremely concerned about these proposals, particularly the restrictions to cars on the main thoroughfares to the city and the consequent likelihood of many local residential roads being turned into “rat-runs” by the traffic diverted from main roads. There are also concerns about the extensive property compulsory purchase orders (CPOs) on roads such as Lower Kimmage Road, Terenure Road East, Rathgar Road and Rathfarnham Road. Information on the Bus Corridors and the NTA’s consultation process can now be viewed on www.busconnects.ie. As you will be aware, a block of 55 build to let (BTL) apartments is proposed for the site at the corner of Templeogue Road and Terenure Road West, currently occupied by Bill Sheehan Motors. There will be 40 one bedroom and 15 two-bedroom apartments. The building will also have three shops and 37 underground car parking spaces. While it is an obvious site for development, we have serious concerns about the current proposal. We feel that because of its bulk, height, design, position and proposed usage, it is inappropriate for this site. Full details can be obtained from the Dublin City Council website, planning reference 4702/18. At a public meeting last Sunday attended by well over 100, all speakers had serious reservations about the proposal. This meeting was organized by Cllr. Mary Freehill. and quote above reference number. Submissions must be accompanied by a fee of €20. Submissions can be made on line from the page the reference number will pull up, or by post. Last day for the Council to receive submissions is Friday 1st February. We have been asked to circulate a list of bullet points, most of which were made at the above meeting. Some of these may be useful in making a submission. • Bulky, block like appearance. • Unsuitable intrusion into and damaging to the historic urban village ambience of Terenure. • The remaining section of the old circle of houses that gave Terenure its old name “Roundtown” will be lost. • Inadequate access for fire brigade to rear of building. • Difficulties caused by vehicles entering and leaving the car park through heavy peak time traffic. • There will be more than the 37 cars owned by tenants of the building. There is no available parking for extra cars on surrounding residential roads. • Is the concept sustainable in the long term?. • With so many vacant shops id Terenure, do we need more? • Allowing a building like this in such a location will set a bad precedent. At this meeting Martin Lynch Architect will make a presentation on the technical aspects of this application to give you a deeper understanding of the implications for the area and to advise you on the technical grounds that you can make your observations. When we Councillors reviewed our City Development Plan last year, we agreed a maximum height of 15 meters which was an increase from 13m previously. Our decision was overruled last December by Eoghan Murphy, Minister for Planning, Housing and Local Government, which now allows a more liberal approach and has lifted the cap on heights, therefore residents need to make technically strong submissions. Dublin Bus have announced that from Sunday 20 January various routes in Dublin, including the 17, will be operated by Go-Ahead Ireland. This is in line with government policy on breaking the monopoly of Dublin Bus as the sole operator of bus services in Dublin. The 17 is the only service in our area which is transferring. Fares will remain unchanged, and all leap cards and travel passes will continue to be valid. Some route amendments and frequency improvements will be introduced shortly, no further details are available at present.